Kathryn Schmidt Steely is Professor of Viola at Baylor University and received the 2007 Outstanding Professor Award for Teaching. She is an avid chamber musician and has performed at several International Viola Congresses, 2014 Primrose International Viola Competition and Festival, the 2014 National College Music Society Convention, and several National Flute Conventions. A former core member of the Jacksonville Symphony Orchestra, she has also performed with the Joffrey Ballet of Chicago, Fort Worth Symphony, Dallas Chamber Orchestra, Akron Symphony, Wichita Symphony, and served as principal viola for the Rockford and Waco Symphonies. She has presented master classes across the country and is a founding faculty member of Credo Chamber Music festival. 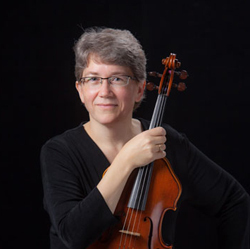 Currently president of the American Viola Society, Steely has also served as editor of the Journal of the American Viola Society and as AVS webmaster. Steely’s MSR Classics disk of the Flackton Viola Sonatas was reviewed by Fanfare as “a delight." She received degrees from Bethel College (BA), the Cleveland Institute of Music (MM), and Northwestern University (DM). Major teachers include Heidi Castleman, Donald McInnes, Lynne Ramsey, and Peter Slowik.